Discussion in 'Lounge' started by Slaking_97, Jan 20, 2019. I'm keeping it short, not wasting your time: why some stuff disappears magically on AZ? Is it like the girl you slept with last night that disappears without leaving a track and you won't ever find it again? Does anyone knows if shawarma is the same as doner kebab or if you can find this stuff anywhere else reliably? Is it like the girl you slept with last night that disappears without leaving a track and you won't ever find it again? Try contacting a staff member if you seek something that has been taken down. They might be able to help you. Yes stuff does "disappear". Reasons are, uploads get taken down by copyright owners (which does happen once in a while), or pirats let their links die - and an annual clean sweep serves to purge. Or so I guess anyway. As to your quest bringing to light the difference between doner kebab & shawarama, well I'm in Amsterdam right now where locally doner kebab is known as shawarama, and vice versa. Over here they sell you pork for lamb (well they's both chops, ain't they?) and beefburgers are continually exposed as minced horse! No jokes, man. Yes stuff does "disappear". Reasons are, uploads get taken down by copyright owners (which does happen once in a while), or pirats let their links die - and an annual cleansweep sees to purge. Or so I guess anyway. Yeah, the thing is that back in the days (and i mean last year) i used to look for taken down things on demonoid, fozzy had some really juicy packs, but ever since demonoid has not worked anymore and fozzy disappeared with it i usually give up on stuff that i don't find anymore on audioz, since it's the only reliable and safe source i know to get stuff from. Fear of viruses and bad stuff on other sites, especially torrents. Last thing i want is my work pc not working anymore. Over here they sell you pork for lamb (well they's both chops, ain't they?) and beefburgers are continually exposed as minced horse! No jokes, man. Really? Well I guess when you're hungry you don't pay too much attention to what you eat. Here in Italy i don't even wanna know what types of meat they put in shawarma (here is called kebab). Knowledge is scary, ignorance is joy! Knowledge is scary, ignorance is joy! Funny you should think that, to me it's always been quite the opposite er, I mean, ! You're right about viruses and scareware loading down from shady sources... just stick with sis site (where they spell out Audio from A to Z). A post wouldn't disappear for this reason. 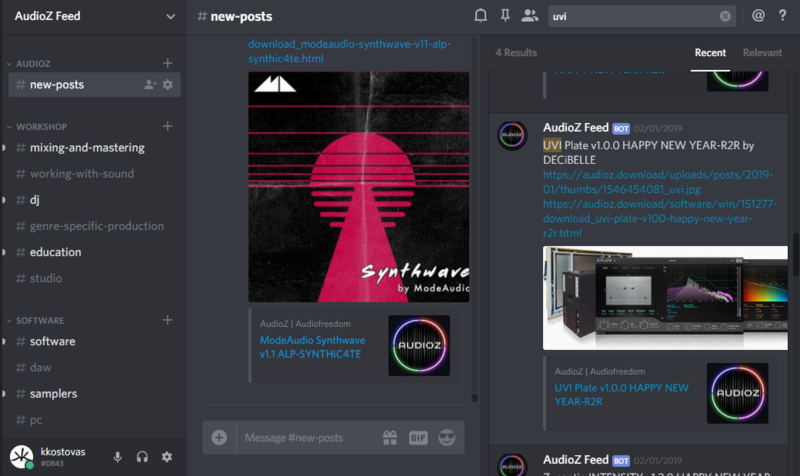 The only reason why a post disappear from AudioZ is when we receive a take down request from developers. If links are dead, we do our best to re-up. If we can't we mark the post as dead, in case a member have the file and can post a mirror. But we don't delete it. On my side, I was thinking about something like that. But they list only official releases, not AZ's "exclusives" and other "personal" releases. Of course, you can go at AZ and then recheck at AudioNews (they have almost everything) or somewhere else... but that's not very convenient. The goal is to check everything at AZ, download there what you want and decide afterward to go somewhere else for the rest. So the best and easy way to proceed in case of a take down request would be to NOT DELETE THE POST BUT ONLY THE DL LINKS. Edited by Olymoon: deleted quote including link to warez. Except Tone2, I don't think much else disappeared from audioz, at least from the newer releases. UVI Plate for example, released by R2R on January 3rd, not there anymore. Some sample packs disappeared as well, just hours after the release. I don't think it's a bad thing that releases are taken down when it is requested. There are other ways to have a list of all releases. And then you can search the web I guess. AZ has a Discord server? That's some juicy news! Is it closed invitation only or free to join?